Here's a small floral design. What is synonym for Spring? Flowers. 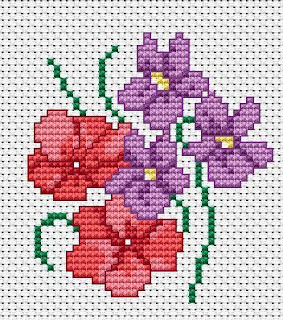 Make a Happy Spring cross stitch card or what you want for fun, to express yourself of just to make someone happy. Add more elements, or more text etc. Change the colors if you want. There are 3 nuances of red here and 2 for the violets .You need also a little green and yellow threads to finish the picture. If you want to share your finished piece with other stitchers, just e-mail me and I will upload it.